Te Rūnanga o Kaikōura Inc has applied for 3 freshwater mātaitai reserves at Kaikoura.The Ministry for Primary Industries (MPI) invites submissions about the fish stocks in the areas from persons who take fish, aquatic life, or seaweed or own quota, and whose ability to take such fish, aquatic life, or seaweed or whose ownership interest in quota may be affected by the proposed mātaitai reserves. Te Rūnanga o Kaikōura Inc and the Ministry for Primary Industries have previously consulted with the local community on the applications. 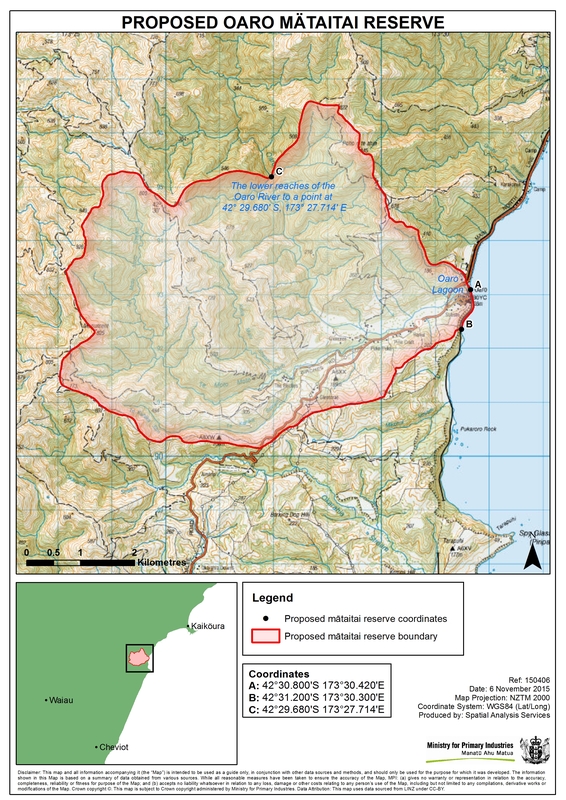 The fisheries waters in the lower reaches of the Kahutara River catchment, from the river mouth inland to Blunts Road and Inland Kaikoura Road, including Lake Rotorua; Rakaunui Stream and Humbug Stream, but excluding an area within the boundaries commencing at 42°25.451'S 173°34.664'E, then proceeding east to a point at 42°25.450'S 173°34.860'E, then proceeding in a north-northwest direction to a point at 42°25.354'S 173°34.806'E, then proceeding due west to a point at 42°25.354'S 173°34.719'E, and then proceeding in a south-southwest direction to the point of commencement. 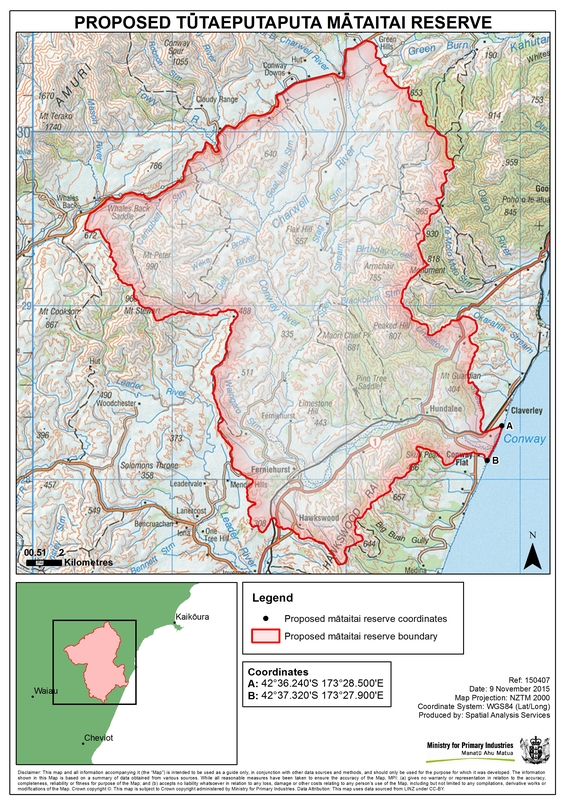 The fisheries waters in the lower reaches of the Conway River catchment, from the river mouth inland to the Inland Kaikoura Road, including the Conway River and its tributaries; the Limestone, Spey, Blackburn, Stag, Goat Hills, Campbell and Waingaro Streams; the Charwell and Gelt Rivers; Birthday Creek and Weka Brook. 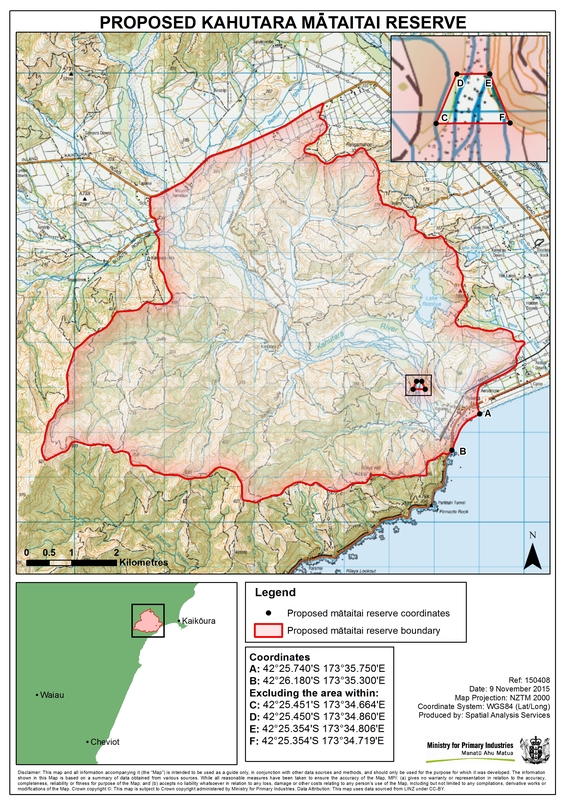 The fisheries waters in the lower reaches of the Oaro River catchment, commencing at the northwestern and southwestern boundaries of the existing Oaro Mātaitai Reserve, and proceeding inland to include the Oaro Lagoon; the Kaka Mutu, Te Moto Moto and Te Kahika Streams; and the lower reaches of the Oaro River up to a point at 42°29.680'S 173°27.714'E. Public notices about the call for written submissions are scheduled to appear in The Marlborough Express and The Kaikoura Star on Wednesday 24 February 2016. The closing date for written submissions from persons who take fish, aquatic life, or seaweed or own quota, and whose ability to take such fish, aquatic life, or seaweed or whose ownership interest in quota may be affected by the proposed mātaitai reserves is Monday, 4 April 2016. Email your submission to FMSubmissions@mpi.govt.nz.